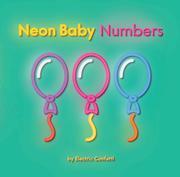 This counting board book presents both numbers and objects in bright, neon outlines. The left-hand page of each double-page spread shows a large numeral from one to 10, with the number written out (“one”) in black lowercase type on the bottom of the page. Each right-hand page offers images of specific objects to count, each object (cupcakes, fish) similarly drawn in a range of neon colors, with the word written in black lowercase type beneath. The background of each page is a different color, bright and vivid, with the neon numbers and objects popping on the pages. Some of these objects (cherries, flowers) may be more familiar to the toddler age group than others (a flamingo?). Some of the drawings, particularly those of feathers and buttons, are not clear representations of the actual objects, which may be confusing to the youngest readers. Electric Confetti is the pseudonym of Australian graphic designer and neon artist Natalie Jarvis, who has a neon shop in Melbourne and an online presence as well. She has created all the luminous artwork in LED neon. There seems to be no theme to this collection (which includes one flamingo, four bicycles, five balloons, and eight “love hearts”), and there is no surprise or twist by the time readers reach 10. 1, 2, 3 BOARD BOOK; WHAT IS IT?